Guest Post by A.L. Parks + Spotlight on Return to Newport + Contest! Eve is ready for a clean slate. She nearly lost the love of her life in The Return. Now Eve must confront the people refusing to let her go quietly into her happily ever after with Jake. Returning to Newport to tie up loose ends may be the biggest mistake of her life. Jake wants one thing – and one thing only – Eve. He is ready to build a life with her, and spend the rest of his days loving only her. But his surprise visit to Newport makes him question everything he thought he knew about her, including her love. At the center of the turmoil is Eve’s ex-husband. Intrigued by the changes he sees in her, Brad is determined to sabotage Jake and Eve’s relationship – and take Eve back. Jake and Eve must face their demons, and battle the outside forces that seek to destroy their future. Can their love survive the Return to Newport? Unique: Existing as the only one or as the sole example. When I first started into the crazy, mixed-up world of publishing, I had no idea what I was doing. I had a couple of really great author friend’s who would offer advice, forward articles on various topics, and listen to me whine. They still listen to me whine. One of the things I first learned was that I had to discover what made me stand-out from other authors. What did I have to offer that was different? How was I unique? I thought on that for a while. I became discouraged, somewhat offended, by the question. What do you mean, what makes me unique? Just being me, that’s what! No one writes like me. And while that may be true, a new question lingered at the back of my mind, a voice that taunted me. So, I pondered the question, obsessed over it. So what? So what is it about me that will make readers remember me, want to come back to me time and time again to read my works? And then it hit me. My voice, my characters, my books…they are me. There is a little piece of my life and experiences in every single one of them. Then came the incessantly annoying, so what? I squared my shoulders, and thrust out my chest. And in a strong voice (albeit inside my head) I answered so what? My books have experience. My books deal with issues that are outside the mainstream of current romance trends. My characters are not about falling in love for the first time – in fact, first love has completely failed them. I write what I know. I know that my first love was many years ago. I know that, as much as I thought I had found “the one,” I was wrong. Blame it on youth and inexperience. Blame it on a need to be “in love” and making the relationship into something more than it was. Blame it on the fact that, sometimes, people just grow apart, no matter how much they seemed to be perfect for one another. Or maybe it is a combination of these things. The point is…it is a highly romantic notion that the person you meet when you are in your youth is the person you will remain in love with forever. And I know there are people out there for which this is true. This is their life and their love. They have put in the work to make it last. They have been able to see the person they feel in love with at the start, and nurture that love along the way. I am in awe of them. I wish them the best. But the reality is that for a big portion of the population, first love has failed. And for those people, there is a hope, a wish, a dream of a second chance at love. And that is what I write about. I write about how the fears and demons affect my characters. How they want desperately to find love – true love – but cannot always trust that they have found it. They doubt themselves; doubt their hearts. After all, they thought they had found “the one” and it had not lasted. How can they be sure it will be any different a second time around? My characters do a great deal of soul searching. They discover who they really are, bolster their strengths and accept and work on their weaknesses. Sometimes the hardest thing a person can do is tune out the voices that seek to destroy self-esteem, a voice without love in their heart, only hurt, pain and revenge. Instead, the voice that is blocked out is the one of the person that has shown love and compassion, and wants to build self-esteem, not tear it down. The stories I write are a journey for the characters. It is sometimes sweet, sometimes exasperating, sometimes heart-wrenching. But in the end, they all learn that second chances do exist. And so that is what makes me exclusive, different, rare, uncommon, an individual, and some other synonyms. I write about hope, and love, and experience. I write about second chances at love. Because that is what I live. It’s what I know. And it is what I want to share. Navy – well a man in the Navy – Parks has lived in various places throughout the United States. Now she resides in the Washington D.C area, and loves every minute. She has four children, and one spoiled German Shepard. 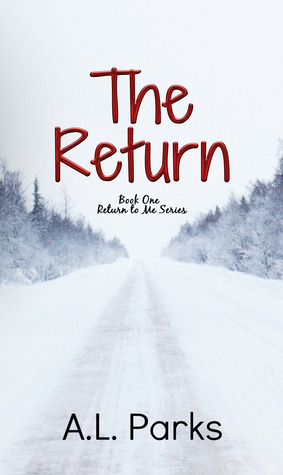 Her second novel, The Return, released in December 2013. A wonderful Christmas romance, it is the first book in a series. Book Two is set to release in Spring 2014. Thanks for hosting AL Parks today, Kat! !